The 4-year old Kojak, the 5-year old Hermes de Hus and the 6-year old Django de Charry were the winners of the young horse championship classes held at the 2013 French Dressage Championships in Saumur, France, on 26 - 29 September 2013. Thirty-five horses in total gathered in Saumur for the young dressage classes to contest the National Young Horse Championship. 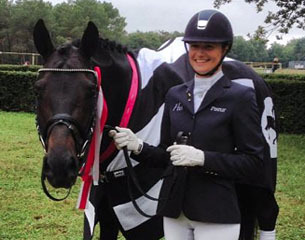 In the 4-year old division Clemence Cathala and her own Trakehner bred Kojak (by Grand Passion x Kennedy) became the overall winner after finishing second in the first round (83.00) and third in the second round (85,40). With an average score of 85.000 Kojak became the 4-year old French young horse champion. The gelding edged out Jessica Michel aboard her own Hanoverian bred Divine Star (by Desperados x Rohdiamant). The duo was only 11th in the first round (77.00) but climbed its way up to first place in round two with 86.40 to finished on the second highest average of 84.833%. Pierra Volla and his own Hanoverian gelding Don Meyer (by Don Frederico x Weltmeyer) were third with 84.667%. Leaving her top 5-year old and last year's French 4-year old champion Don Juan de Hus at home to give the licensed and actively breeding stallion a break after World Young Horse Championships in Verden, Jessica Michel steered her other Verden mount Hermes de Hus (by Hotline x Rohdiamant) to victory in the 5-year old division. The combination averaged 85.609%, winning round one with 88.33 and placing second in round two with 85.20. Jean Etienne Suisse de Sainte Clair finished second aboard the Hanoverian Domingo H (by Don Henrico x Baryshnikov). They were only 13th in the first round with 73.17% but improved dramatically in round two to post a winning score of 86.60%. Maeva Hoang and Nicolas Verstraeten's Dutch warmblood registered Diolita DN (by Tango x Glendale) were third with an average of 77.043%. In the 6-year old category Jean François Combecave steered the bay Hanoverian gelding Django de Charry (by Dancier x Londonderry) to victory with an 82.561% scoring average. The pair finished only 21st in the first round with 70.17% but won the second round with 83.80%. They edged out Bernadette Brune on the Oldenburg gelding Di Magic (by Dimaggio x Rohdiamant) by a fraction of a point. Brune scored 82.33% in the first round to rank third and 82.20% in the second round to finish second. She averaged 82.212%. Bertille Pelardy and the bay Hanoverian Hilario Saint H (by Herzensdieb x Acorado) slotted in third after ranking ninth in round one (75.50) and third in the second round (79.00). They were third with an average of 78.682%.